Surface probes are difficult to calibrate because it’s hard to find a flat, heated surface that’s stable and uniform. The model 3125 Surface Dry-Well takes advantage of our proprietary 2200 Temperature Controller and gives you the best possible conditions for calibrating surface sensors. 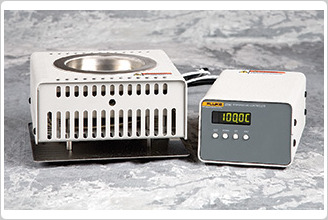 Why buy a non-temperature calibration device designed for test tube sterilization or PC board repair when you can have a true calibration instrument? 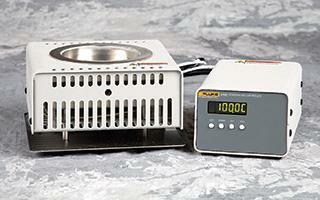 The 3125 has a uniform surface temperature and reaches temperatures as high as 400°C. The test surface is milled aluminum for an absolutely smooth and true calibration work area with maximum thermal conductivity. The 12.25-square-inch test surface is large enough to calibrate more than one sensor at a time. The 3125 can be used with a reference surface sensor or PRT. PRTs (3/16" diameter, such as the 5615) may be inserted through a drilled hole into the center of the block for use as reference thermometers or for easy recalibration of the unit’s display. With an accuracy of ±0.5 °C to 200 °C and ±1 °C to 400 °C, you can calibrate almost any surface probe, thermistor, thin film sensor, RTD, thermocouple, ribbon sensor, or surface mount cutouts, fuses, and switches. Stability is within ±0.3 °C at 400 °C and uniformity within the center three inches of the surface is ±0.6 °C at 200 °C. Don’t buy “make-do" hot plates when you can have a legitimate calibration tool.